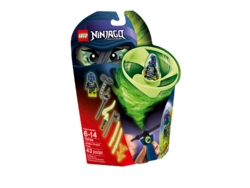 70744 Airjitzu Wrayth Flyer is a Ninjago set released in June 2015. This is a description taken from LEGO.com. Please do not modify it. (visit this item's product page) Build, rip and watch Wrayth fly! Power into aerial battle with the super-spinning LEGO® NINJAGO™ Wrayth Flyer! Ghost Warrior Wrayth is armed with an axe, golden shurikens, swords and other cool weapons and ready for action. So build his personal flyer, attach the minifigure capsule and pull the rip cord—the harder you pull, the further Wrayth will fly! 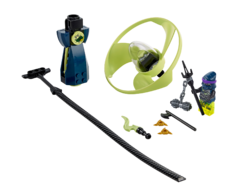 This set includes a Ghost Warrior Wrayth minifigure, buildable LEGO brick handle, vortex rotor, minifigure capsule, rip cord, plus assorted elements: Wrayth’s axe, Phantom Flame,Spine Chiller, 2 golden shurikens and 2 ghost swords. Pull the rip cord to send the ghost warrior spinning through the air! Facts about "70744 Airjitzu Wrayth Flyer"